Opera Cabal regularly hosts a Salon Series on the South Side of Chicago dedicated to fostering the growth of unusual contemporary performance in its beginning stages. The Salons are a forum for scholars, free thinkers and artists of any definition, both local and countrywide, giving priority to those producing uncommon work that can be difficult to program in conventional settings. Grounded in the University of Chicago tradition of open artistic inquiry, the Salons offer the opportunity to share and critique work in an intimate and rigorous workshop environment. Founded in 2006, the Salons are exclusively not-for-profit, community-based, and open to the public by invitation. Salons are generously hosted by the University of Chicago Stein Freiler Distinguished Service Professor in Physics, Sidney Nagel, and Fermilab Deputy Director, Young-Kee Kim. The most recent salon was held, January 21, 2017. Email us at contact@operacabal.com to be added to the list. Founded in 2015, the Berkeley Salons are hosted by Matthew Walker (UC Berkeley Professor of Psychology and Neuroscience) and Majel Connery (Artistic Director of Opera Cabal). The salons are dedicated to the presentation of cutting-edge artistic practice, transformative science, and human inquiry. 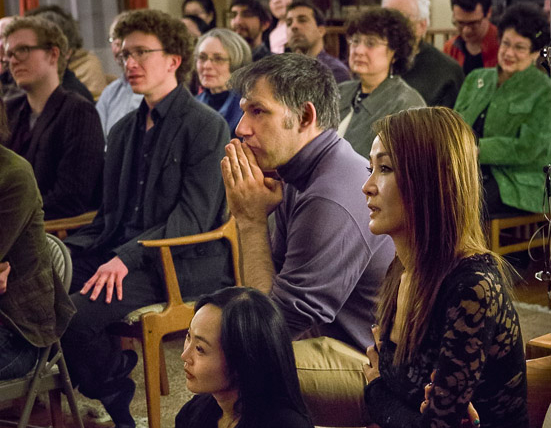 Grounded in Berkeley's iconoclastic tradition, the Salons offer a small, intimate venue for scholars, free thinkers and performers to share ideas and spark conversation with a like-minded audience. The Berkeley Salons have hosted speakers and performers from the sciences including Piermaria Oddone, Steve Croft, Stephen Hinshaw, Edward Frenkel, and Nipun Mehta, and from the arts and humanities Ken Ueno, Kurt Rohde, Martin Jay, Tom Laqueur, Jonathan Vinocour, Teddy Rankin-Parker and The Living Earth Show.